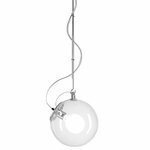 Miconos pendant light, designed by Ernesto Gismondi for Artemide, is an attractive, refined pendant light that combines a hand-blown glass globe with a sleek, adjustable metal rod and a hook for hanging. The end result is both delicate and dashing at the same time. You can alter the appearance of Miconos with different light bulbs – the transparent glass globe creates a beautiful nest for many kinds of decorative bulbs. Miconos is dimmable and can be used as the main light or fascinating detail in any interior.